We are pleased to announce that an English version of the Law on Copyright and Related Rights and the Industrial Property Law is now available in bookshops. These acts were translated by our Law Firm's experts in co-operation with C.H. Beck Publishers. 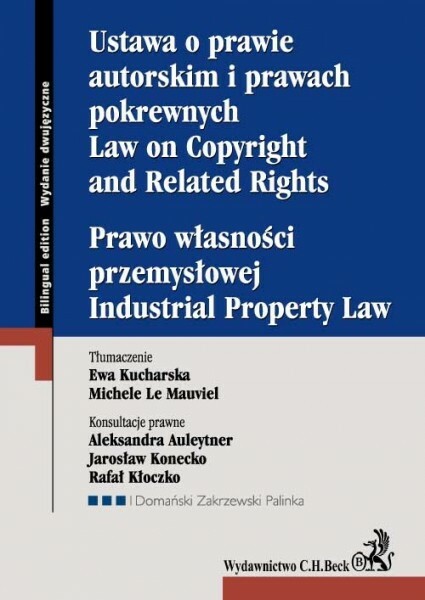 This collection, published as a part of the new series of translations of Polish acts of law into English, German and French, includes the English translation of the Law on Copyright and Related Rights and the Industrial Property Law. Wording of the Acts in effect as at March 2014. The texts were translated by Ewa Kucharska and Michele Le Mauviel, who have also translated, e.g. the Code of Commercial Companies, the Civil Code, the Public Procurement Law and the Pharmaceutical Law. They have many years' experience in working with legal translations at DZP and an excellent understanding of the specific nature of the Polish legal system. Legal consultation was provided by Aleksandra Auleytner, Jarosław Konecko and Rafał Kłoczko – IP&TMT Practice's experts at Domański Zakrzewski Palinka.